In the first part of this two-part article on erasing (brace yourselves, this article will be every bit as engaging as the last), I proposed an approach to removing markings from books that relied heavily on experimentation and experience gained from it. For one thing, there is no end to the types of paper used in printing books; for another, there is almost no end to the types of erasers available. On a recent visit to an art supply store I counted no fewer than 33 different products. Since over half of these appeared to be duplicates of other brands, I narrowed my selection for this project to twelve, using the criteria that each eraser differed from the other either in form, hardness or composition. After a few minutes of experimentation, it was clear that most of these had been designed for specialized applications that would be of little or no use to a bookseller who occasionally erases a name or other marking in a book. The four that remained performed with varying degrees of success. 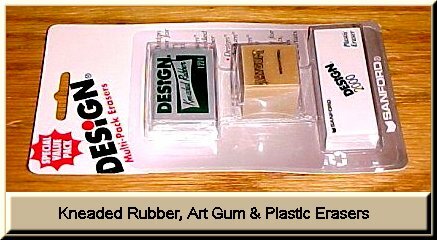 They were the art gum eraser, the white plastic (or vinyl) eraser, the gray plastic eraser, and the kneaded rubber eraser. (Figure 1.). Absent from my list is the common pink eraser, often sold under the brand name Pink Pearl or Pink Dragon and found on the ends of most pencils. Though this is the most widely used of all erasers in both pencil and stand-alone form, it's clearly the worst performer. In the classic New York University study of dry cleaning products conducted in 1981, it was demonstrated that the Pink Pearl eraser significantly abraded paper surfaces, deposited numerous crumbs that were either difficult or impossible to remove from fibers, altered color and texture, and worse, increased pH to a more acidic level - a factor that can contribute to foxing and other forms of degradation down the road. Also, as most of us already know from first-hand experience, this eraser has a tendency to smudge and will quickly accumulate a film of, for example, graphite on its outer surface and redeposit it elsewhere on the surface being worked on. Need I say more? Dump it. Also absent from the final 4 was the Koh-I-Noor 9600 eraser, a pricey number impregnated with erasing fluid. I had particularly high hopes for this product, as it seemed to promise a two-pronged attack. Apparently, however, it's designed for use on film and specialty papers. On the papers I tested, it was unequivocally a dud. In the strictly mechanical sense of the word, erasing is a form of sanding, or abrading, and no matter how gently it's done, it will tear fibers or otherwise disturb the paper that's being erased. Therefore, it's best to attempt it first with the least abrasive eraser possible. The common art gum eraser is a good candidate for your first pass. These erasers are inexpensive and widely available, and, because of their softness, a good deal of pressure can be applied without noticeably damaging the underlying surface. Often this will be sufficient for removing penciled markings and to some extent crayon. As erasing progresses, the media adheres to the eraser and is deposited in the form of crumbs, which can then be brushed away. The art gum eraser will increase pH to some extent, but not as dramatically as the Pink Pearl. It's also marketed in a powdered, bagged form for more delicate applications. The bag is squeezed over the area to be treated, powder is deposited, and the area is lightly rubbed with a fingertip. The art gum eraser is especially useful for removing general soiling from paper. I've used it with great success to clean the covers of booklets, brochures and paperbacks. If anything remains after the first step, a less flexible, more abrasive eraser may get the job done. The plastic or vinyl eraser, marketed under such brand names as Factis, Design and Magic Rub, is a good choice. This eraser doesn't alter the pH of the paper in any measurable sense and does a good job of removing and absorbing graphite with little apparent change to the surface being treated. 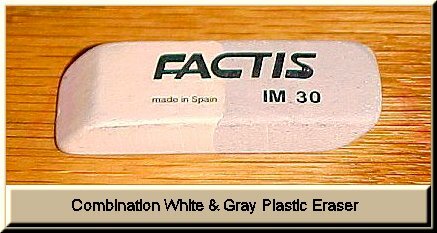 Varying degrees of hardness are available, and I had the best results with the Factis S20, a soft cousin of the standard hard Factis. Perhaps my results were affected in some way by my technique or lack of patience, but the hard Factis had a tendency to deform the paper, sometimes creating a noticeable wrinkle or depression on the erased area. The gray eraser (Figure 2. ), often called an ink eraser, is clearly the most aggressive I tested. The Factis version is similar in composition to the white but contains more pumice at a higher grit size. 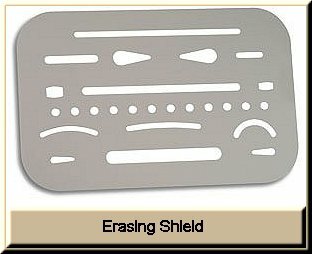 In my opinion, it should be used with great caution, if at all, and preferably in conjunction with an erasing shield (Figure 3.) to minimize the degree of damage and confine it to small areas. Even so, visible damage will inevitably occur, leaving erased paper roughened and dull. Please keep in mind that ink will often penetrate much deeper into the fibers of paper than graphite, and removing a mark entirely may risk complete penetration of the paper. I should also mention that these types of erasers are not uniform in composition or quality. If possible, use a brand (such as Factis) with an established reputation for quality. The final product in my short list, the kneaded rubber eraser, seems well suited to cleaning areas that are otherwise difficult to get to with more conventional erasers because it can be molded to any shape. The downside is that it tends to deposit a significant amount of material in the paper fibers, alters color to some extent, and elevates pH. Personally, I can live without it. Most conservationists agree that erasing, if attempted at all, should be approached with great patience, exercising as much control as possible, using short light strokes in one direction, frequently brushing away accumulated crumbs, and periodically wiping residue that accumulates on the eraser. For those who have difficulty with control or are particularly fussy about the process, an electric or motorized eraser may be the answer. Two popular brands are the Sakura Cordless Eraser and Koh-I-Noor eraser. Tips can be interchanged for different applications, and my brief test of the Sakura at the art supply store demonstrated that exceptional control could be exercised, especially if done under a magnifying glass. Expect to pay anywhere from $40 to $80 for one of these. In conclusion, erasing is a reasonably good method for removing graphite, some crayon, and light soiling from most types of paper but is significantly less effective for removing ink and far more likely to produce damage in the attempt. In any case, I would be very reluctant to go after a valuable book with an eraser without first consulting a conservationist. Alternate methods for removing ink will be presented in future issues of the Bookologist, a new newsletter for online booksellers coming soon from AuctionBytes. Craig Stark is a full-time online bookseller and former Editor of The Bookologist, a newsletter from the publisher of AuctionBytes.